But I worked hard for that happiness. This was my first time formatting a document for POD. Anybody who’s done it twice probably knows most of what follows. I profited greatly from others who took the time to write about their own POD journeys. My thanks to everyone who made the process easier for me. Because I was formatting specifically for CreateSpace, some of this post won’t be applicable to other POD manufacturers. I do think, however, that the steps I followed present a framework that can be adapted. CreateSpace itself is rather lax in documenting the POD formatting process. The CreateSpace community, however, is good, and should be your first stop when you have questions. The file I started with was a copy of the e-book file I posted to Smashwords. As a practical matter the difference between the Word file and the e-book file is that the Smashwords conversion uses styles to format paragraphs. TYOTE is a work of fiction. As such this post contains no information about complex layouts, tables and graphs, images, pull quotes, etc. I did do a killer job on my headers and page numbers, though. The single most important thing you can do while formatting your book for POD is to protect your original files and your conversion files at various stages in the process. Learning how to format for POD is difficult enough. Having to do things over again because you lost a file or forgot to save at a crucial stage is a nightmare. Everybody knows they need to back up their data or risk catastrophic loss. They don’t do it, but they know they should. Protecting documents that are being worked on is just as important, but trickier, which is why many companies adopt formal version/revision-control practices. That’s overkill for an independent author, but the goal of protecting against lost development time or the unintentional creation of conflicting versions remains. Saving frequently is critical when you are working on data. Most people save from time to time, but don’t do it in a dedicated manner. The decision to save is usually triggered by recognition of the fact that the document hasn’t been saved lately, rather than by an awareness that saving at a particular point might be advantageous in the future. I see three impediments to good saving habits. First, there’s tunnel vision. When you’re going gangbusters — or pulling your hair out — you don’t want to stop and do something clerical. Second, there’s the problem of knowing when and what to save. Third, there’s the problem of how to save effectively, which I deal with in the following section. The solution to the first problem is experience. Until you flush four hours of complex work down a digital black hole, nothing I say is going to convince you to change your slacker habits. After that data disappears I won’t need to say anything. The solution to the second problem is overkill. When in doubt, save. Once you’re used to doing it, saving a file takes fifteen seconds at most. What should you save? Any change or version you might want later. Most modern software comes with multiple-undo functionality. Much of the time you can make changes and undo them with impunity. In some cases a change may be destructive or permanent (no undo), but the software will usually inform you before you make the change. But what if you make changes, close the application, then want to go back and undo those changes? You can’t. Saving changes as you work preserves files at various stages of development. You may never need them, but if you do you’ll have them. When I’m working on a file I try to recognize stages of development that I might want to revisit. Can that get complicated and confusing? Yes, in mere moments. But don’t let the thought of clutter dissuade you. The bottom line is that if you saved it, you can find it. If you didn’t save it, it’s not there to be found. Tracking and retrieving files is facilitated by adopting good file-naming conventions. I’m not going to go into detail here, but I do want to call attention to some issues you should be aware of. I still struggle with file naming even after years of heavy work in the software/gaming industry. You will probably struggle, too, but less so if you keep the immediate goal of protecting data in mind. What you should aspire to when naming files is consistency over the duration of each project. As you work more with files you’ll necessarily get better at doing so, and will probably adopt new conventions over time. What you don’t want to do is change your conventions in the middle of a project. When you come back to that project later your naming conventions won’t be clear, meaning you’ll have to spend more time digging. Hard drive space is crazy cheap. Saving lots of files is inexpensive, and can recoup a ton of money in development time if you end up using previous files as templates for later projects. More than once I’ve gone back to files I worked on a decade earlier in order to re-use content or look at examples. You should also be aware that there are two different audiences for your files. The great majority of your project files will only be accessed by you. Some files, however, will be shared with others — including those you send to your POD manufacturer or e-book distributor. In the majority of cases it may not matter what conventions you use, but in some instances it will help to use a descriptive or context-sensitive filename that is different from the internal conventions you’ve adopted. For more on file-naming conventions, see here, here, here and here. Note: knowing how to group files by folders and sub-folders is also useful. If you’re not familiar with file and folder management, consult your help files and practice creating folders, sub-folders and simple files. Also make sure your folders always display the full name, size and date of files by default, so you can quickly sort by same. I learned a lot formatting my first POD book, the most important thing being that perfection is not only not possible, it’s not the proper goal. Whether you’re a beginner or a seasoned pro, what you should be aiming for is a convergence of design variables that look right in proportion. The best hour you will ever spend in this regard is the hour you take to look at how other books have been formatted and designed. Use a ruler to measure the various dimensions of books that are similar (or not) to what you want your book to look like. You’ll quickly discover that most books look right and proper as books, but that the specific measurements of everything from a book’s size to its margins to its type vary wildly. That’s the persuasive power of proportion. As I’ve said elsewhere, independent authors have an omnipresent fear that what they create will be dismissed as amateurish. I agree that’s something to avoid if possible, but the fear shouldn’t consume you. Pick up ten books and one of them will probably strike you as ugly or difficult to read, even if it was professionally designed and published. Step 1: Create your content. Edit until finished and error free. Step 2: Format your content for POD as per manufacturer’s requirements. Step 3: Convert content to .pdf for CreateSpace (and many other POD printers). Three steps, of which the first is undeniably the hardest. I say that as a reminder, because when you are bashing your head on your desk over Step 2 or Step 3 you will invariably forget that Step 1 was the real death march. CreateSpace requires that you submit your book in the .pdf file format. It’s essentially a paged image file where each page is an image of a page from your book. That’s what CreateSpace prints, and that’s why you can be reasonably sure that what you submit is what you’ll get back in book form. There is a review stage in the submission process, at which point your file will be checked for compliance. It’s possible your file may be rejected for various reasons, including insufficient margins, but that’s a pretty common occurrence, particularly for first-time publishers. Whoever you use to print your book, pay close attention to that manufacturer’s requirements, but don’t freak out if you need to make a few fixes. You will also be required to submit cover art, but that’s a separate issue. You can see how I handled that part of the TYOTE project here, here and here. I know what you’re looking for: a single-source solution to all of your formatting needs. This post and others like it can help you understand what you need to know, but you still need to learn it. The book you’re making is a custom creation, and you’ll have to develop some skillz in order to make decisions along the way. If that sounds daunting, well, it should. Formatting a book for POD is not rocket science, but you do have to pay attention. That includes sifting and synthesizing information from a lot of sources, some of which may be incomplete or unreliable. Without proper context some of the formatting advice you read will be useless. One person’s personal experience, narrowly expressed, may only apply to that person’s project. There’s also the problem of terminology, and how two people can say the same thing using different terms, or different things using the same terms. The point here is that you should plan on reading and synthesizing before you dive in. Go to the CreateSpace forum and read up on issues you need to know more about. Save links to posts or threads that are useful. Follow outbound links from posts that seem informative. When you start to understand how various posts relate to the specific issue being discussed — when you can see the context, and not just specific answers being suggested — you’ll know you’re ready to tackle that part of the design. The size of your book affects every other design choice you make. It also affects the way the book feels in the reader’s hand, the page count of the book, and your profitability. I looked at a lot of books on my shelf before I decided on the right size for TYOTE. Over time I narrowed the choice to 8.5 x 5.5 and 9 x 6. I preferred the former aesthetically, but I also knew, from using the CreateSpace calculator, that a smaller format would mean an increase in pages, and an increase in pages would affect my pricing and profit. In Microsoft Word the page size of your document is set on the File | Page Setup | Paper tab. 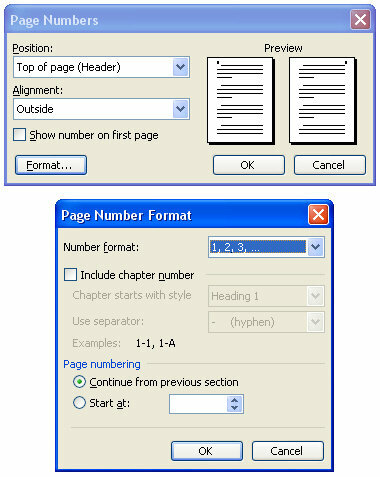 Setting the paper/page size changes the displayed document in Word to the size of the page that CreateSpace will print. Note, however, that it’s always possible to view a page in various view states or zoom sizes. Do not confuse what you see on your monitor with the physical size of the page that will be printed, and do not make decisions about how your book should look based on zoomed views. When in doubt, print it out. Formatting the margins of your book is a big deal. CreateSpace has specific margin requirements that you must meet. If your margins are wrong your submission will be rejected and you will have to make changes. Those changes, in turn, may negatively affect the proportions that looked oh-so-right in your original submission. It’s going to take a while to understand how to format the margins of your book. There’s no shortcut. You’re going to have to read a lot, try things out, and get up to speed on how your word-processing software handles margins. In Word, you can find the margin settings, oddly enough, on the File | Page Setup | Margins tab. But this tab is not as innocent and obvious as it appears to be. Page margins define the content area of your page. (I’m not going to get into issues like ‘bleed’ here.) CreateSpace compels specific minimum margins that you cannot go below, but you can and perhaps should make your margins larger than the minimums. Be careful when you read other posts about setting margins. One person will describe certain margins one way, others will use different terms. The same goes for measuring margins. Some people will quote gutter margin measurements in full, others will differentiate between the gutter margin size and the left and right margins. Don’t know what a gutter margin is? Well, it’s the page margin in the middle (inside) of a book, where the pages are bound together. Because a book opens at the gutter, and because most books can’t fully open without breaking the spine, the additional allowance of the gutter margin prevents sentences from falling into that dingy chasm. Imagine you’re printing a brochure with text on the right-hand pages only. For that project you would want to set left, right, bottom, top and gutter margins, and indeed my version of MSWord has options for all of those settings. But the margins tab also includes a Gutter Position setting with two options: Top and Left. Which one to use? For your brochure you would choose Left. If you wanted the brochure to function like a flip book you would choose Top. For your POD book, however, you would choose neither — except there’s no Neither setting. The reason for this is that a book uses what are called mirror margins (also known as facing pages). The left page has a gutter margin on the right side as it’s printed; the right page has a gutter margin on the left. 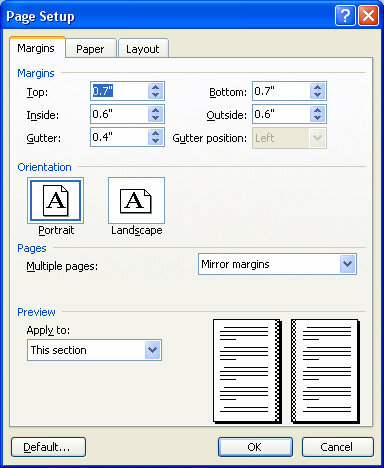 To enable mirror margins in Word you have to look down the Margins tab to a section labeled Pages | Multiple pages, where you’ll find a pulldown menu. Select Mirror margins from that menu and you’ll see that the Gutter position setting above is now ghosted out, preventing you from inputting a value. You’ll also see that Left and Right change to Inside and Outside respectively. The inside margin is the margin in the gutter; the outside margin is the margin at the opposite, outside edge of each page. Ignore the specific numbers and instead note the gutter margin setting. That number plus the inside margin number gives you the full width of the gutter/inside margin. For my book, then, the full inside/gutter margin was one inch, which I found to be a common recommendation in the forums. A final caution — and I really, really recommend you pay attention here. Do not make your margin settings either the widest you can stand or the narrowest. Leave yourself at least one increment of whatever measuring unit you’re using in both directions, in case you need to tweak the margins later. Because sections aren’t visible in your document you need to remember where you’ve added them. For TYOTE each chapter was a different section, along with the beginning and ending copy (table of contents, afterword, etc.). That structure made it easy to remember which section I was working in, and when sections changed. When you make a new section, all of the previous choices you made for paragraph formatting, etc. are inherited. For this reason it makes sense to add sections only when you need to do so to format different parts of your book. You should also save a copy of your content at that point, in case you get confused or do damage to your original formatting. It’s often easier to junk a botched file and start with a clean copy than it is to sort out a bunch of mistakes. The thing to remember here is that everything about your content is a variable that can be changed. Everything. If you’ve been using Word for decades you’ve probably changed line spacing to single-spaced or double-spaced, but those are simply common presets in an infinitely variable range of line-spacing options. Equally important is the fact that many variables affect each other. If you get your line spacing just perfect, then change your font, your line spacing may need tweaking. The options are endless, giving you almost total control, but with that freedom comes an obligation to show restraint. Go slow, be conservative, make simple choices. You can show your flash and dazzle down the road, after you’ve got the basics covered. Almost every book you’ve ever read uses justified text. Enough said. The font you choose will be determined by your goals and preferences. For me there’s nothing more important than transparency: if anybody notices the font I chose it means I chose the wrong font. The goal of finding the right font is separate from the task of formatting your document with that font. When you have a few fonts in mind, make a copy of your document with the intent of deleting it after you’ve compared type styles. Format similar paragraphs with different fonts so you can compare them, and add the name of the font to each formatted paragraph so it’s clear which is which. If you still can’t decide, print out a few samples for yourself and others to compare. I’m bringing the issue up simply to emphasize that you can’t take anything for granted. If you’ve decided to change from Garamond to Georgia, but you also change the zoom on your document at the same time, you may not notice that the actual size of the font on the page just got bigger, which may affect how you feel about your line spacing. I tried 14.4 pt line spacing for my 12-point font, but found it looked too crowded. I wanted my short stories to have an ease to them on the page, so I bumped the line spacing up again and again until I got to 16 pt, which was too big. Backing it down to 15.5 gave me the feel I wanted, even if the spacing was more than the ratio recommended. Again: guidelines are guidelines. I trusted my eye. If you don’t trust your eye, print out different versions and ask others which they find most pleasing or easy to read. Unless you’ve done something like this before, you’ve probably never set a specific line spacing for a document in your life. 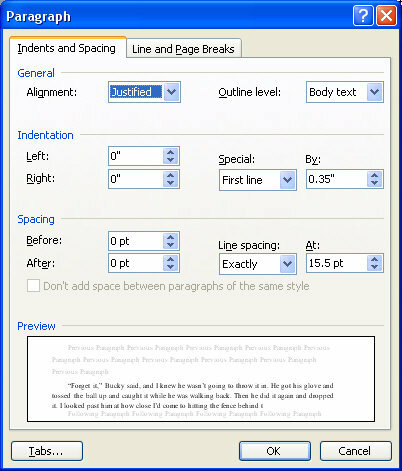 In fact, even if you’ve looked at the line-spacing settings in Word, you may not know you can do so. Widow/Orphan control Prevents Microsoft Word from printing the last line of a paragraph by itself at the top of a page (a widow) or the first line of a paragraph by itself at the bottom of a page (an orphan). I unchecked this box and turned widow/orphan control off because I didn’t want Word making decisions for me that I didn’t specifically approve. Rather than bone up on what was happening with the automatic selections, I simplified the process so I always knew how the document would respond at each page break. Just as it’s possible to set line spacing exactly, it’s also possible to set the spacing between individual letters. If you do your homework — and you should — you’ll find a lot of people talking about this variable. I ignored it, for two reasons. First, the default setting for the font I chose seemed fine. Second, there seemed to be a lot of confusion about terminology and values, including use of the word ‘leading’ which was also used to describe line spacing. Without any evidence of a benefit, and with clear evidence of confusion, I opted to keep things simple. I refrained from mentioning page order earlier because it’s particularly applicable to the issue of headers and footers. Page order is also determined by page breaks, so you should be comfortable working with automatic and manual page breaks. The good news is that you can monkey around with your page order while formatting the bulk of your book. As long as you keep the following in mind, you should be okay. If you take any five books and open them randomly, all of the pages on the right side will be odd-numbered, and all of the pages on the left will be even-numbered. This convention makes sense because the first paper page of any book is always the page opposite the inside of the cover, meaning it’s page one — an odd number. In modern times the first page may be blank, sport a logo, or contain the title, but it probably doesn’t have a page number on it. Still, it’s the first page — an odd page — and that fact establishes the even/left, odd/right pattern that plays out in almost every book. For your book you should always think of each page that will appear on the right as odd-numbered, and each page on the left as even-numbered — whether or not those specific pages have page numbers printed on them. Why is this important? Because you and your POD printer have to agree on which page comes first, or your book will be reversed when printed. And your POD printer expects the first paper page of your book to be an odd-numbered page. Warning: if you add a page zero you must also ignore headers and footers in that copy of the document. As you will see in the next section, headers and footers are slaved to odd/even pages. Adding a single page at the front of a document changes each odd page to even, and vice versa — but it doesn’t change the headers. Formatting headers and footers is going to make you insane. If you have medication, take it. If you have a therapist, ask them to stand by. If you have small furry animals, put them somewhere safe. The first thing you should do is look at a lot of books to see what choices others have made. It’s mind-blowing how many variations are possible. I originally intended to put title and chapter references in the header, and page numbers in the footer, but for reasons of spacing and formatting I decided late in the process to have everything in the header. The headers for TYOTE show the title of the book on all even/left pages, the chapter title on all odd/right pages, per chapter, and page numbers only on those pages that contain fiction. (There are no page numbers on the dedication page or afterword page, for example.) On those few pages that were not also a chapter, I used my name to populate the odd/right header. If I haven’t already convinced you to practice making changes on disposable copies of your content, working with headers will make you bow to that practice in quivering subservience. Under no circumstances should you attempt to format headers and footers in your original document until you understand what you’re trying to do, and even then you should work on a copy of the file in case you make mistakes — because you’re going to make mistakes. 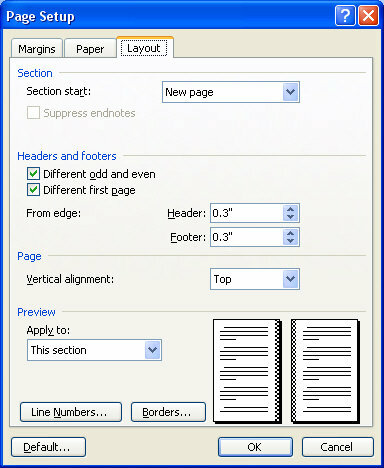 In Word you access headers and footers via the View | Headers and Footers menu option. If this makes no sense to you, join the club. Unlike many formatting options, modifying headers and footers does not open up a tab of options. Rather, viewing them displays the headers and footers in the current document, along with a toolbar. However: there is a Headers and Footers section on the File | Page Setup | Layout tab, and if you have not made the right choices there you will have no chance of formatting your headers and footers correctly. The header/footer for the first page of the section. The first odd-page header/footer that is not also the first page of the section. The first even-page header/footer that is not also the first page of the section. Even if you know how to access your headers and footers, and even after you decide which check boxes to check or uncheck, and even after you split your document into sections, you will still not be able to control the headers and footers of your document. If you try to do so at this stage you will find that information you input in one place shows up ten sections later. What the highlighted button tells you is that the header in the second section is taking its marching orders from the header in the first section. If you change the information in either header, all other headers that are connected to the header you change will also be updated. The button acts like a toggle. Press it once, it goes off. Press it again, it comes on. The only indication you’ll have that a header (or footer) in one section is following a header in the previous section is that the button will be highlighted (or not) and the words Same as previous will appear (or not) over that header or footer. It should go without saying that if you want to have different headers (or footers) in subsequent sections, you should click that button once so that it is not highlighted. And remember: there are three different header types in TYOTE, meaning three different ways in which one section can be connected to the next. On the header/footer toolbar there are several buttons for including and formatting page numbers. I tried using those buttons several times, but after a while I gave up. As someone who’s been using Word for over twenty years, I can say with confidence that automatic page numbering is voodoo, and you’re probably better off controlling the page numbering yourself. Setting the location, size and style of page numbers can easily become a nightmare, and all the more so if you don’t already understand how to control your headers and footers. For that reason you should not try to include page numbers in your document until you have learned to control your headers and footers. The critical setting here should be obvious to you now: it’s the radio button that says Continue from previous section. If you add a page number anywhere and that radio button is set, then your page numbers will continue. That’s true for every section, and every header and footer. In TYOTE I chose not to include numbers for pages outside the actual contents of the book. I also started my page numbering not at ‘1’, but at ‘7’, because the first page of fiction appeared on the seventh page of the book. In order to do that I changed the page-number radio button for the first chapter to Start at, and set the number at ‘7’. Thereafter every page number in every header continued from the previous section. When you have your document formatted exactly as you want it to be printed, it’s time to convert it to the .pdf format that CreateSpace will accept. If you don’t have a program that can handle that conversion I suggest you download the latest version of the OpenOffice suite, which you can find here. It is possible that viewing your Word document in Writer will cause small changes in the way your document paginates. Those changes will show up in your converted .pdf if you don’t fix them. You are going to be tempted to use Writer to fix these small changes, but you should not do so under any circumstance. Whatever mistakes or compromises you have already made in the service of expediency, you do not want to use two different applications to format the contents of your book. No matter how frustrated you get, limit yourself to using Writer to make the conversion to .pdf. Don’t edit your contents in Writer, don’t change any formatting settings, don’t even nudge a margin here or a tab there. Why? Because then you’ll have to figure out how to save your contents using Writer, because those small changes will be part of the final formatting of your document. Instead of a complete Word file, you’ll have an almost-complete Word file that you then tweaked in another application, and that will be your final, print-ready draft. Which means, in the future, that you’ll either have to work with the Writer version, or you’ll have to go back to the almost-complete Word version. Both are bad choices. What if you do find small changes when you open/view your Word document in Writer? In my case Writer added a wee bit of length to each page, causing the final pages of chapters/sections to vary. In some cases that added an extra page to a chapter, and that was a big problem because it changed all of the following pages from even to odd or vice versa. Since I planned to start each new chapter on an odd page, one extra page in the middle of my text messed up everything that followed, including headers and footers. After making a series of small changes in Word and testing them by converting to .pdf, I finally found success by adjusting the margins in the original Word doc. That’s why I strongly urge you to leave some padding in your margin settings. I was fortunate to have done so, and saved myself a lot of extra work. To make the margin fix in Word I selected the entire document — Edit | Select All — then backed off the top, bottom and gutter margin by 0.1, making them all a wee bit smaller. (If you don’t select the whole document you may only change margin settings for the page you’re on.) When I loaded the doc back into Writer I found that the length of the document and the pages/chapters displayed as originally intended. Again: always test changes in a copy of your final text. You should view your contents in Writer after you make each change, so you know what that change does or does not do. Finally, when you’re sure your document is displaying as you intend it to print in both Word and Writer, go ahead and convert to .pdf. Then check the document again. On the Export as PDF menu you’ll find a ton of tabs and settings. I left everything set to the defaults, with one exception having to do with embedding fonts in the .pdf file. I’m still not sure I needed to make that change, but I erred on the side of caution. You can read more about that option here. — I needed to change the wording on my copyright page to satisfy a CreateSpace requirement. When I went back to the Word file I’d converted to .pdf I discovered that a small change I’d made at the last minute (deleting a single paragraph mark on a blank line) had thrown most of the document off by a whole page. The originally-submitted .pdf had been correct (somehow), but had I not noticed the corruption of the original file, and resubmitted it after making my copyright-page fix, it would have been wrong, wrong, wrong. — Word had converted several manual page breaks into auto-formatted breaks that only announced themselves with a small square to one side of those paragraphs, and then only when I had the Show/Hide button set to Show. I had to do some digging to figure out what the little squares meant, then more digging to understand how to fix the page-break problem. Even now I can’t tell you what happened or why. If you approach the POD formatting process in a sequential manner, and save your work in a sequential manner, you’ll be pleased with the result. If you jump around, make changes willy-nilly, forget to save often or to test changes in disposable saves, you’ll have a frustrating experience. Read. Ask questions. Go slow. Practice. Test. Implement. You do good work in the CS forum. I profited from your advice more than once. I like your generosity, Mark. This would have been very helpful to me when I was a newbie. 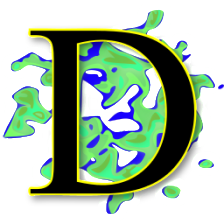 BTW, I’ve had good results with PDFsuite995: http://software995.com/ (free). You can make a PDF without openig your doc in another word-processing program. Thanks for props and the software rec, Brent. I saw a number of positive references to that conversion software, but I was already familiar with OO Writer so I stayed with it. I’ll take a look at 995 before I convert my next work.